The ad man adjusts his heavy-rimmed glasses before launching confidently into a presentation of ‘qual & quant’ consumer research results proving the effectiveness of the last campaign. Consumers loved it and they showed intent to purchase Brand X as a result. The media buyer goes next and presents a whole host of facts and figures about the target consumer and the best routes to reach them. She has endless data at her fingertips and her voice is all the more powerful because she is media-neutral and has no axe to grind. True she is more familiar with bought and owned media than earned media, but nevertheless she is listened to as an oracle. The below-the-line agency add their views now; the client loves them because they can show such a quick and concrete connection between their on-pack and digital promotions and resulting sales. Doesn’t matter how long the sales uplift lasts because the client just needs to get through the next tricky few months. It is the eternal PR nightmare. Evaluation is the albatross hanging around the neck of the PR industry. I would wager that thousands of days have been spent in search of the PR evaluation Holy Grail – but read any set of PR evaluation guidelines promoted by agencies or industry bodies and you could weep. No wonder there are PR-sceptic clients. No wonder PR gets pushed down the marketing agenda. But what to do? Especially when any mention of evaluation elicits a collective groan from any self-respecting group of PR people. PR should absolutely be considered as a key sales generator by brand owners. Because PR leads to trust which leads to sales. PR generates editorial content, and according to Nielsen (above table), editorial content is trusted by 69% of consumers - more than TV ads, newspaper ads, radio ads, billboards and cinema ads. And way way more than ads in search engines, mobile phone text ads and online banner ads. PR beats ‘em all - but just because PR can’t produce the data which other channels can there is a tendency by some marketers to put their money where the data is…rather than where the consumer trust is. PR has another string to its bow too: great creative PR not only generates editorial content but also stimulates word-of-mouth. 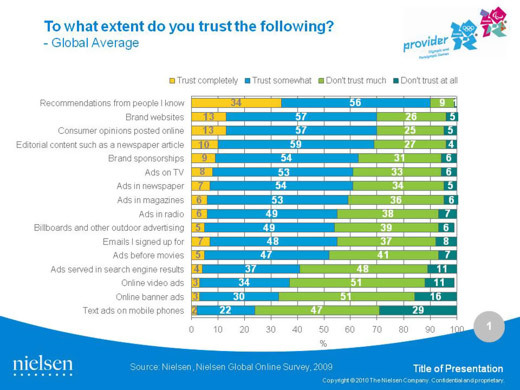 We know that consumers trust what they read about a brand in newspaper editorial, but trusting the information means they are more likely to recommend that brand to others - and the No1 trusted channel on the Nielsen list by far is peer recommendation, as 90% of consumers trust ‘recommendations from people I know’. Similarly, the third most powerful channel is ‘consumer opinions online’, which again can be influenced by PR; it is PR agencies who can most effectively influence ‘citizen journalists’. Yet despite the power of this ‘earned’ online recommendation, according to McKinsey & Company only 20% of digital marketers spend is allocated to Earned Media (PR territory) - the rest is spent on Owned Media (e.g. websites and apps) and Bought Media (e.g. banner ads). While Owned Media can certainly inspire trust (brand websites come high in the Nielsen list) surely Bought Media is over-invested in (according to Mediamind the average global click through rate for banner advertising has declined from 0.12% in 2007 to 0.08% in 2010). Research from Mext Consulting also shows that ’83% of consumers agree they will buy more products and services if they trust a brand’ and ’81% recommend a brand they trust’. What’s more, ’47% agree they would pay a premium for a band they trust’. A final word from Millward Brown: ‘The bond between customer and brand is 50% stronger among brands that consumers say they both trust and recommend. And a stronger bond leads to greater sales’. In summary, PR communicates through channels which are the most trusted by consumers (editorial, consumer opinion online and peer recommendation) stimulating brand trust, and this trust results directly in sales – so while PR may not deliver the data that the other disciplines do, it can certainly deliver the sales, which many marketers are currently under increased pressure to deliver.